Had you conducted a poll in 2003 to determine which artists fans thought would still be going strong nearly 15 years later, I doubt Seether would top many lists. Although they had a remarkably strong debut the group has always shied away from the spotlight and has never shown much interest in playing the self-promotion game, which, for lesser artists, spells almost instant death. Although early adopters to the idea of making an online connection with fans they’ve all but become social media recluses over the years. As social media was being recognized as a near-necessity in the music industry that was right about the time the Seether camp started backing away and opting for a bare bones social media presence. And though they may be missing out on gaining and retaining a few fans by refusing to play the social media game, if lead singer Shaun Morgan’s lyrics are any hint they probably consider that a perk- it almost acts as a litmus test of sorts. Now, with their seventh full-length studio release, Poison the Parish, the band has woven together all of their strongest aspects while incorporating new elements in a way that is sure to delight long-time listeners, as well as attract a whole new wave of fans. Add in the fact that this album was entirely self-produced, and it feels as though fans are finally getting an unfiltered taste of all that Seether has to offer. 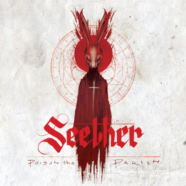 You’ll hear it time and time again- Poison the Parish is Seether’s heaviest release in years, but the heaviness is expressed differently than it has been in the past. In previous releases it often took the form of guttural screams and growls and distorted guitars blaring at full blast, but on Parish the darkness feels far more refined, showing up most frequently in the general mood as opposed to the tone itself. There’s a menacing darkness that forms the foundation of the vast majority of songs on Seether’s newest release, painting a pretty bleak soundscape for listeners to journey through. To be clear, the loudness is still there, but it almost feels secondary- like an accent as opposed to the focus. A haunting track of feedback sets the tone of the album as it ushers listeners into the twisted world held within the tracks on Parish, and seconds later the menacing riff of the album’s second single “Stoke the Fire” kicks in with full force. Although the heaviness of the album doesn’t rely on Morgan’s classic guttural screams that’s not to suggest those screams are lacking on the album, and he wastes little time sprinkling in tasteful doses in “Stoke the Fire’s” bridge. In a surprising change of pace, “Betray and Degrade,” the album’s lightest track (for want of a better phrase), follows “Stoke the Fire.” The levity of the track’s verses is somewhat reminiscent of Isolate and Medicate’s hit single “Same Damn Life” and leads into a soaring chorus that’s so catchy it’s sure to be an immediate favorite, especially if the band chooses to incorporate it into their live show. This seems like territory Seether will continue to explore- combining music that is decidedly “happy” and upbeat with their signature dark lyrical style- it definitely makes for an interesting contrast. Most artists seem to cram their best material at the beginning and end of an album, with much of the middle being forgettable ‘filler’ tracks, but the middle of Poison the Parish gives listeners an unrelenting stream of killer tracks that, far from blending in to one another, truly stand apart and hold their own. One of the most interesting aspects of examining new material from artists who have had a lengthy career is comparing and contrasting the old and new, especially when you start looking at how they approach certain subjects over time. Although it’s all certainly open to interpretation, it seems “I’ll Survive” is wrestling with the same issues addressed in the band’s breakthrough single, “Fine Again,” off 2002’s Disclaimer. It’s interesting to compare the 24-year-old Shaun Morgan singing about the relentlessness of depression, with the nearly 40-year-old Morgan addressing the same topic. In both songs Morgan takes the approach of focusing on the fact that, despite numerous blows, he’s still standing. But interestingly enough, both songs leave you feeling like that’s not as much of a positive thing as you would initially think, but actually a relentless and exhausting feeling of being trapped and doomed to repeat these cycles. He’ll never fully give in to the demons that have been hounding him, but that doesn’t mean he’ll be victorious over them and ‘breathe a sigh’ of relief either. Although this general topic has been examined on every Seether release, it was fascinating to hear what seemed to be such a direct “revisiting” of sorts, whether it was conscious and intentional or not, it’s sure to make for a really cool experience for long-time fans who tend to dig a bit deeper into the tracks. Lead single “Let You Down” keeps the energy high as you journey further into the album. After hearing the album as a whole “Let You Down” definitely seems to be the most logical choice for a lead single, as it manages to represent the album as a whole in ways the other tracks might be a bit too stylized to accomplish. The album’s strongest point comes with the track “Against the Wall,” which is quite reminiscent of “Crash” off 2014’s Isolate and Medicate and, at the risk of sounding melodramatic, is genuinely breath taking. Although the track treads familiar musical territory it never feels too similar, but rather feels as though it’s building upon a foundation the band laid with their last release. “Against the Wall” stands as a shining example of what Morgan does best, as he delivers vulnerable and transparent lyrics to date with his gritty vocals contrasting against a shimmering musical backdrop. With lyrics such as “I’ve played it out, I can’t seem to find the peace I’ve heard about, am I not supposed to?” “Against the Wall” contains some of Morgan’s most point-blank and honest lyrics of his career. The flange-heavy guitar hooks in “Count Me Out” and “Emotionless” sound straight out of the early 90’s, which will excite fans who fell in love with Seether for their ‘post-grunge’ sound. The verses of “Emotionless” in particular take the group farther into the Alice in Chains territory than they’ve ever gone before. If this was something they leaned on heavily over numerous songs or albums it would definitely be a drawback, but considering this is pretty different from anything else they’ve put out the throwback sound just comes across as exciting. There’s a bit of a southern rock swagger that seems to be woven throughout the album- just a pinch of swampy, muddy, twang, that underscores the group’s signature style beautifully. In some ways Poison the Parish actually feels like a bit of a departure for the band, just because there does seem to be such a heavy influence of blues-y southern rock, but it’s integrated in such a way that it feels like a natural evolution. Many have accused Seether of playing it too safe- of returning to the same thing over and over again, although of course, many who would claim such a thing would also be among the first to demonize artists like Linkin Park or Silverchair (and especially Daniel Johns’ solo work) for deviating from their original sound so much. It seems as though Seether realized early in their career that the public taste and opinion is often fickle and fleeting, so instead of trying to figure out what the new hot thing will be in 6 months time, they’re just going to keep doing their thing, whether or not that happens to be the popular thing at the time. Is Poison the Parish similar to what they’ve done in the past? Absolutely. But there’s a massive difference between churning out the same old thing time and time again, and recognizing your interests and strengths, and consciously choosing to devote yourself to growing and evolving in that particular lane- pushing your skills in that particular area, as opposed to hopping all over the map- and that’s every bit as respectable as an artist who is constantly trying something totally new. One could certainly argue that trying to stay within a certain style as long as Seether has is actually more impressive, as they’ve somehow managed to keep their sound and material fresh and relevant, which is no small task! Managing to stick to their guns and still continue to thrive in an industry that tries to make every artist be everything to everybody, maybe it’s time to stop criticizing Seether for being “narrow” and start celebrating the laser-like focus and drive the band has continued to show over their career. One thing is for sure- you’d be hard pressed to find a band as relentlessly driven this far into their career as Seether is. Poison the Parish is out Friday, May 12th on Concord Bicycle Music. The group has already kicked off their Poison the Parish World Tour which will continue through October when the band hits Europe. The group will be making the rounds at most of the summer festivals this year, as well as continuing their annual Rise Above Festival, held in Bangor, Maine, in support of suicide prevention and awareness. In 2016 vocalist Shaun Morgan was awarded the Artistic Expression Award from the National Council for Behavioral Health due to his efforts with Rise Above Fest, which he was inspired to start after the death of his brother in 2008. In a mere three years the festival has raised over $100,000 for suicide awareness groups, and is set to have their biggest year to date now that they’ve expanded to 2-days for 2017 and will feature artists such as Korn, Stone Sour, Shinedown, and Halestorm.